The Spectrum Helicopter settled gently beside the wreckage pin-pointed by Rhapsody Angel. Captain Ochre winced when he saw the gaping hole punched out by the explosion. Captain Grey had already seen it and pulled down his cap microphone. “S. I. G.,” acknowledged Lieutenant Green. Captain Ochre shut down the engines and followed by Captain Grey, disembarked from the helicopter. Carefully, they made their way towards the wreckage. The moon was just dipping below the mountain peaks now and the two Spectrum officers had to use torches to examine the hulk. “What do you think?” Grey asked Ochre, the more aviation minded of the two. Presently they came to the hatch. From the slight buckling of the edges and the scorch marks on the paintwork, they could tell that the hatch had been blown free then, for whatever reason, placed back over the hole. “At least one of them got out o.k.,” commented Ochre stepping inside, leaving Grey waiting outside. Ochre came back out almost immediately “They’ve gone,” he informed Grey. 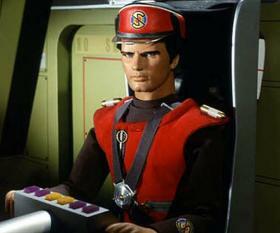 “What about Captain Scarlet’s body?” asked Grey. Up in the Cloudbase Control Room, Lieutenant Green acknowledged the call. “Good luck,” he added before signing off. Technically, it was against Spectrum communications regulations, but Green had the feeling that his colleagues would need all the luck they could get. The cell was small, windowless and furnished with only the bare minimum, a two tier bunk, a table and a couple of chairs. A door led into the small room, more of an alcove, in which the W.C., wash basin and shower cubicle were to be found. The only light came from a bare bulb, protected by armoured glass, recessed into the ceiling. Colonel White looked at his watch. Three fifteen. He’d been in the cell, beneath the main Hall of Justice for more than three hours. Food had been brought, of course, but he still did not dare touch it. The door creaked open and in marched a prison Warder “Got some company for you,” he informed White with a grin. He looked back over his shoulder. “O. K. lads, you can wheel ’em in,” he called. Two police officers, one supporting Captain Blue as he hobbled in, the other escorting Destiny Angel, entered the cell. The police officer supporting Blue helped him onto one of the chairs, Destiny took the other. The police officers and Prison Warder left, closing and locking the door behind them. “DON’T TOUCH THAT!” White’s voice carried a note of urgency that Destiny had never heard before. She pulled her hand back, as if stung, from the plate of food that she’d been about to sample. “How can you be so sure, Colonel?” asked Captain Blue. “Your message only just reached us in time, Colonel,” Blue replied. “But what about the food?” asked Destiny. “Mon Dieu!” Destiny gasped, putting her hand to her mouth. Silence descended on the three. The same appalling thought struck them. Someone was trying to kill them. But who? And why? The problem with hospitals, Captain Scarlet decided, was that there weren’t enough corridor plans. “Maybe the designers of this place ought to try and find their way out.” He said to himself. So far, there had been no signs of life, not even a porter he could ask for directions. As he approached a door, he could hear voices. Perhaps it was a staff room or something. He knocked on the door. No reply. He knocked again. Still no reply, though the voices were definitely coming from the other side of the door. He tried the door. It opened revealing a darkened room, the only illumination being from a television screen in the corner. Scarlet found the light switch and pressed it. Revealed by the light was an assortment of easy chairs and low tables with magazines and newspapers strewn carelessly across their tops. A set of french windows, presently curtained, led out into what would be a small garden. This was obviously a day room, probably for some of the patients. A brief burst of music attracted Scarlet’s attention back to the television. The scene changed to an outside view of the Hospital, bathed in the glow from spotlights set into the lawn around it. The Reporter was standing next to one of the presidential security guards, who was looking rather nervous in the glare of world publicity. Nurse Daniels’ instructions had been very clear on one point in particular, on no account was she to administer any treatment to the patient without a doctor present. Since Jaeger had left those instructions, some two hours had elapsed and it was time for the patient to receive another injection. Of Jaeger there had been no sign. With a sigh, Nurse Daniels had decided that, under the circumstances, ANY doctor would do so she’d set out to look for one. As she left the patient’s room, the guard, waiting outside snapped to attention. “I’m going to fetch a doctor so that we can administer treatment to the President,” she informed him. “Very good, miss,” the guard acknowledged. She shuddered at the sight of his rifle then walked away down the corridor. Scarlet sighed and shook his head sadly. Grayson could never resist an opportunity to smear Spectrum. Nurse Daniels was getting agitated, she could not seem to find a doctor anywhere. As she approached a day room, she saw that the light was on. Putting her head round the door, she saw a white coat. She didn’t care who it was, they would do. Scarlet, however, was unable to see any of this. He was being led, down a corridor, by a desperate nurse Daniels. For all her youth and lack of size, she was a force to be reckoned with. “Now look, nurse…” Scarlet protested to no avail. He stopped himself. To blow his cover now could be dangerous. This nurse could bring security troops down around his ears. The cottage was in darkness when Captains Grey and Ochre reached it. They had followed the footsteps from the crash site and been led here. “It looks deserted,” Grey observed. “I’m going to look around the back,” said Ochre. “S. I. G.,” replied Grey. “Be careful!” he added as an afterthought. “Yeah, don’t worry,” replied Ochre with a smile. Carefully, he picked his way around the side of the cottage. All the windows were closed and in darkness. Finally, Ochre reached the back garden. It was much darker now that the moon had set and he found it necessary to use his torch. Suddenly he froze. A pair of golden eyes were staring at him. Obviously some kind of guard dog, perhaps a Doberman or Rottweiler. Very slowly, he drew his pistol and prepared to fire. “Good boy,” he called to the creature. He blinked and the golden eyes disappeared, to be replaced by a pale blur running towards him. His finger tightened on the trigger then relaxed as the furry form purred and rubbed itself around his legs. A cat! Ochre realised that he’d been holding his breath and let it out in a rush. He put his gun away and bent down to pick the animal up. It appeared to be a pedigree Persian, little more than a kitten. It purred contentedly as he tickled it gently under the chin. The cat leapt from his hands, startled by the high pitched tone and the flashing of his epaulettes as his cap microphone dropped into position. “Go ahead Captain Grey,” Ochre acknowledged. The cat had decided to show off a little. It walked slowly away then lay down and rolled over onto his back, front paws drawn up to his chin, back legs splayed apart. It looked appealingly at Ochre. “Er, yeah, I had a close encounter with a cat,” Ochre replied. “A cat?” there was a note of disbelief in Grey’s voice. The cat had decided that it was cold. It got up, strolled over to the patch of ground under the kitchen window, gathered itself, then sprang for the window that had conveniently been left open for it. “S. I. G.” replied Grey. Gingerly, Captain Ochre opened the window further and climbed in. By torchlight, he picked his way through to the front of the house, the cat trailing happily at his heels. Ochre opened the front door to admit Captain Grey. Grey entered but left the door on the latch, in case a hurried exit was required. “What are we looking for?” asked Ochre as they began to search. Indeed, although there was a well kept larder, there were no signs that anyone ever used the contents. There were no empty food containers in any of the bins and the wastepaper basket was also empty. In fact, the only apparent inhabitant of the cottage was the cat, presently busy grooming himself. Eventually, the two Spectrum Officers found themselves back, once more, in the lounge. There had been no evidence whatsoever that their colleagues had visited this place. “Hey, what’s this?” Grey asked, as he picked up one of the photographs from the lid of the piano. By chance, it happened to be the photograph, taken a few weeks before, of the skiing party. “Do you recognise him?” he asked as Ochre looked at the portrait. Although wrapped up warm against the snow, the father figure in the photograph was Senator Charles Grayson. The sound of an approaching car made further investigation impossible. The two officers ran from the house, slamming the door behind them. It would be dangerous to be discovered in the Senator’s private cottage. As Grey sprinted for the cover of some shrubs, his foot slipped on a patch of ice and he fell sprawling. As he hit the ground, he noticed a scrap of blue. Without thinking, he grabbed for the object and dived the last few feet into the bushes, landing on Captain Ochre. The car sped into the drive, the beams from its headlights sweeping over the area so recently occupied by Captain Grey. The car came to a halt, its lights were doused and silence returned as the sole occupant switched off the engine. From behind the bush, Grey and Ochre watched as the driver got out of the car and let himself into the cottage. “So, Captain Blue was here,” said Ochre, looking at Blue’s cap that Grey held in his hands. “Let’s get back to the helicopter, ” suggested Ochre. On Cloudbase, a light flashed on Lieutenant Green’s console. “Go ahead Captain Grey,” he acknowledged. “S. I. G.” Grey and Ochre acknowledged before closing the channel. Captain Grey was puzzled by Ochre’s request for information. “Why the interest in Grayson’s family life?” he asked as they began to trudge down the hillside towards the helicopter. “We searched that house from top to bottom, right?” began Ochre. “So where were the family?” asked Ochre. “Away for the weekend, perhaps?” suggested Grey. “I’d hardly call and S.P.V. inconspicuous,” pointed out Captain Ochre, starting the helicopter’s engines. Indeed, the Spectrum Pursuit Vehicle was capable of taking just about any punishment thrown at it and if necessary, dishing it out by means of a high-powered cannon, normally concealed within the front part of the vehicle. Captain Ochre could see the logic in this. With a deft touch on the controls, the helicopter rose gently from the ground and set course, away from the lights of Geneva, towards the hiding place of the nearest S.P.V., a filling station near the mouth of the Trans-Alpine tunnel. Duvall, the owner of the station, a small, balding man in his fifties was glad to see them. Since the closure of the tunnel, through traffic and hence business, had been minimal. Captain Grey wasted no time. “Spectrum Pursuit Vehicle Three Two Four, please,” he requested. “Identification please, m’sieu.” Duvall was taking no chances. Captain Grey showed him his pass. “Merci,” said Duvall, pressing a concealed switch under the cash register. With a smooth whine of machinery, the building containing the car wash slid backwards, revealing a large rectangular hole in the concrete hardstanding. A concealed lift whirred into action bringing the silvery-blue bulk of the S.P.V. up from its underground garage. Captain Grey had one more request of Duvall. “Do you have any paint spraying equipment?” he asked him. “What’s the idea?” asked Captain Ochre, puzzled by the strange request. The job took about ten minutes in all. Because the large bulk of the S.P.V. prevented it from entering the paint shop, the spraying had to be carried out outside, by torchlight. Not a brilliant job, Grey would have been the first to admit, but it would do. Fortunately, Duvall had carried out some minor maintenance on the S.P.V. a week or so before, so he still had some paint left over. “Good luck M’sieu,” Duvall called after them as the S.P.V. rolled across the garage forecourt, its headlights brilliantly illuminating the road in front of it. It turned onto the main road towards Geneva. “S. I. G.” came the acknowledgement from Lieutenant Green. A few minutes later, the S.P.V. reached a fork in the road. Through their T.V. monitors, by means of which they saw the road ahead, whilst sitting backwards in the S.P.V., the two Spectrum Officers could see the road sign just before the fork. The road to the left led to Geneva, via the mountains. The other arrow on the sign, pointing to the right-hand fork, again indicated Geneva, this time via the Trans Alpine Tunnel, a much shorter route. This road, however had a large TUNNEL CLOSED sign blocking it. “Oh no we won’t,” replied Grey, “hold on.” With that, he gunned the engine of the S.P.V. which surged forward. The sign never stood a chance. With a splintering crash, the S.P.V. hit it dead on, shattering it and sending slivers of wood flying in all directions. The S. P. V sped on as if nothing had happened. As they approached the tunnel, they both noticed something strange about it. The brilliant beams from its lights lancing through the sable blackness within the tunnel, the S.P.V. sped towards Geneva.